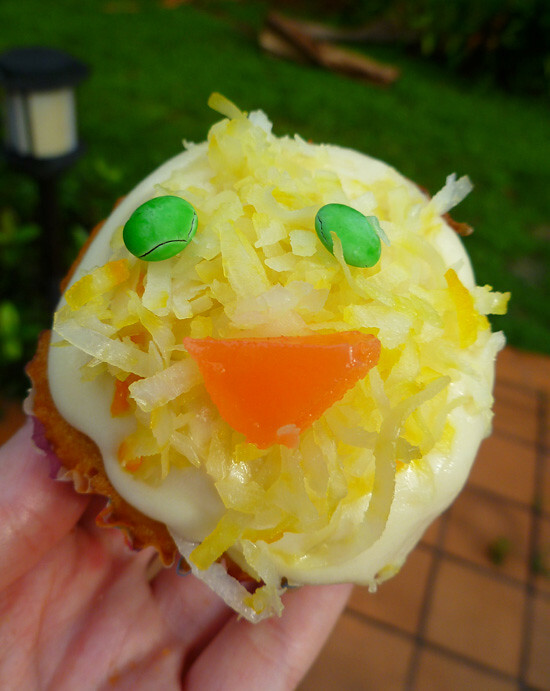 The first Easter treat I will be posting about is the Coconut Easter Chicks Cupcakes I made... Let me tell you, these are DE-LI-CIOUS! If you are a Coconut lover like me, you are going to LOVE these!! It's basically a coconut cupcake filled with toasted coconut and coconut cream topped with a Cream cheese frosting. So when you bite into these soft and moist cupcakes, you are encountered with the delicious toasted coconut in the center... 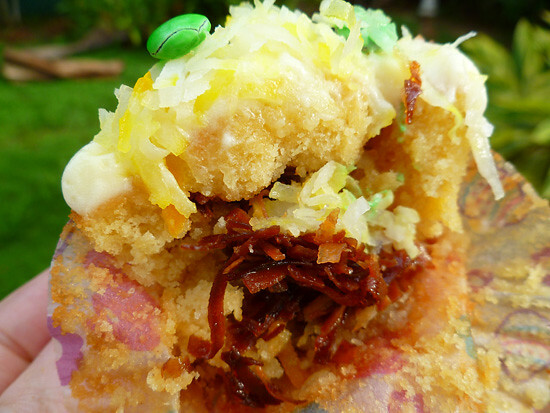 I'm telling you, these cupcakes are a coconut dream come true! 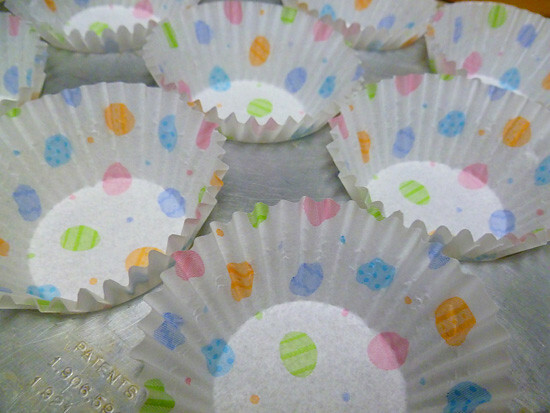 Apart from decorating the cupcakes as Easter chicks, I also made these cupcakes very Easter-y by baking them in Easter cups. So cute! I followed the recipe for the cupcake batter exactly, and they turned out great! Super moist and with a delicious coconut flavor that isn't overpowering. After baking the cupcakes, I toasted some coconut for the filling. Then I mixed the toasted coconut with some coconut cream to make the filling. I made a hole in each cupcake using a knife, and then stuffed them as much as I could. 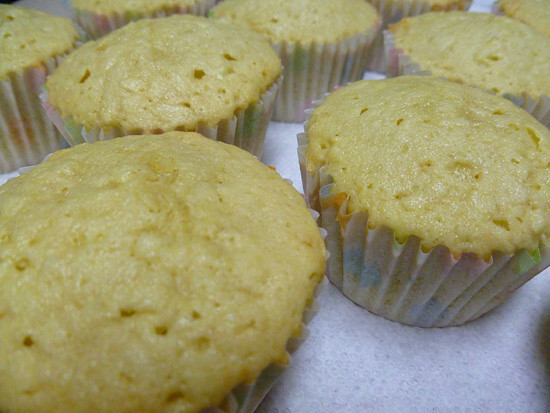 The coconut cream made the center of the cupcakes even more moist and soft. 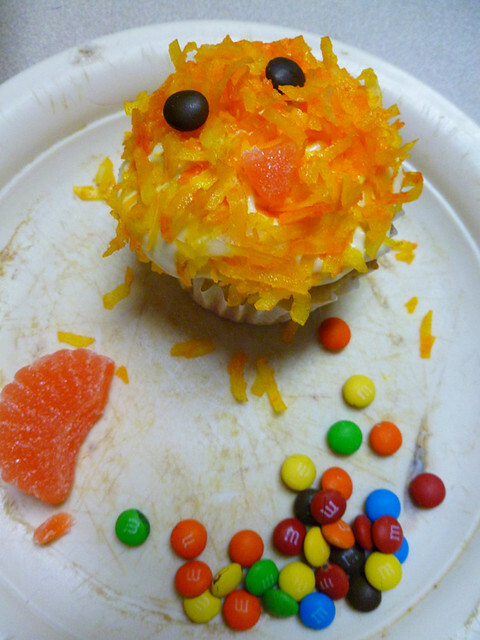 After frosting the cupcakes, I used yellow tinted coconut flakes, M&M's, and orange gummies to decorate the cupcakes as Easter Chicks. I got the idea from the Betty Crocker Website. The first batch of cupcakes I decorated turned out very orange. It seems that I put too much yellow food coloring into the coconut flakes, so these chicks were more like super tanned chicks! hehe. 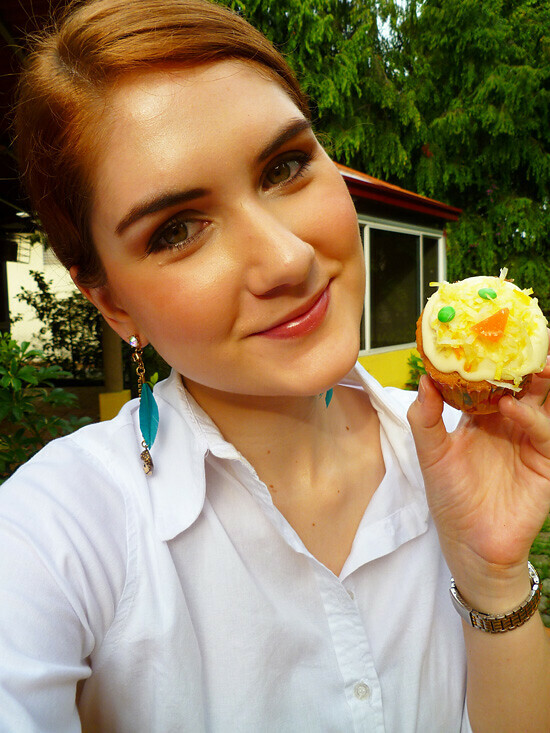 I would definitely recommend baking these cupcakes... they were simply delicious! (9.5/10 for sure!). Preheat oven to 350 degrees F. Line or grease a cupcake tin. In a large mixing bowl, cream the butter and sugar until light and fluffy. Add the eggs one at a time, beating well after each addition. Beat in the vanilla extract. In another bowl, whisk together the flour, flaked coconut, and baking powder. Beat 1/3 of the flour mixture into the wet ingredients. Alternatively add the flour mixture and coconut milk to the wet ingredients, blending until smooth after each addition. Fill the cupcake liners about 3/4 full. 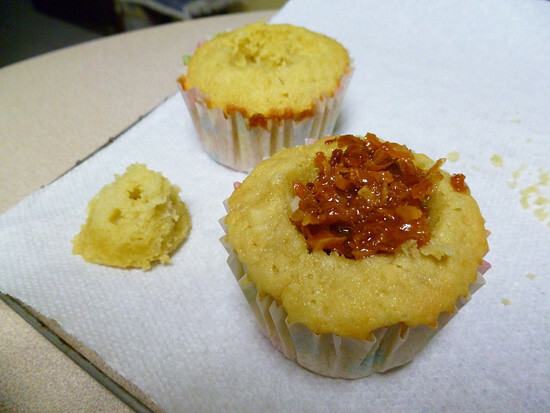 Bake for 18-22 minutes, or until a toothpick inserted into a cupcake comes out clean. Allow to cool completely before filling. In a small bowl, mix together the coconut cream and toasted coconut. Set aside. Beat together the heavy whipping cream, vanilla, and sugar until soft peaks form. I first mixed the Cream cheese and Heavy cream together using an electric mixer Then I just added powdered sugar (while beating with an electric mixer) until the frosting became thick enough to be piped. I know it's not perfect, but I thought it turned out pretty good! Take a cupcake and, using a sharp knife, cut out a cavity in the center of the cupcake. I run the knife in a circular motion, while always pointing the knife towards the center of the cupcake. The cavity should be coned shaped. Alternatively, you can use a cupcake corer if you have one. Spoon the filling into the cupcake until the filling just reaches the top. Cut off the interior of the cupcake you've removed and place back on the top, pressing down so it becomes flush with the cupcake. Pipe or spread the whipped cream frosting on top of the cupcakes. 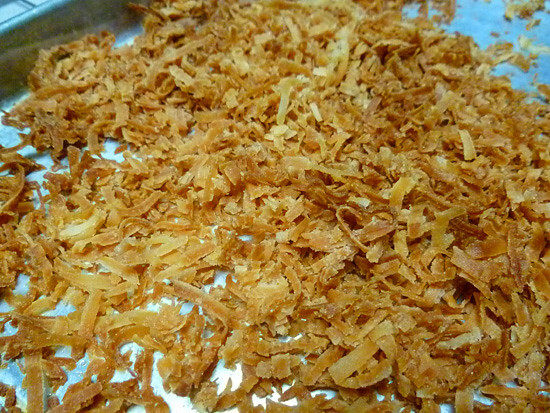 Sprinkle with extra toasted coconut flakes. Enjoy! Yummy! You're such a great baker! I love how you're always making treats!